Bring together everything you know about your leads. The cost of having customer data scattered around several different legacy systems is higher than you might think. Integration has great potential for marketing, and that potential must be taken into account when evaluating the transition to whole new way of doing business: one where you have synchronised customer information, a single management point for all customer interactions. Ultimately, companies who succeed in doing this will always have a competitive advantage over those who don’t. Integration brings about enhanced customer experience and accelerates growth. Synchronised customer information in a single management point for all customer interactions. It may sound unthinkable but the reality is that many companies segment their leads for marketing actions without having a full picture of who they are. The result is inappropriately targeted content which can actually decrease the probability of that lead to convert. BySide Lead Amplifier aggregates data from both internal systems (any lead database that you might have) with that from external sources, such as search ad management platforms, display networks and social networks, to give you the full picture of your leads. Also, if you combine this with BySide contacts (Click2Call, Video2Call, Click2Chat) and Call Tracker, you can easily enrich this information with records on call activity and outcome. BySide Lead Amplifier aggregates data to give you the full picture of your leads. Today, everything in marketing seems to be multi-something. Devices, displays, touchpoints, channels, just to name a few of the “multi” jargon. But you know that customers are not devices or displays. They don’t interact with your brand through a single touchpoint, and you do not use only one channel to reach them. Customers are unique, no matter how many devices, displays or channels they use. As customers or leads find the screen, device and channel that is the most convenient regarding their purpose and location at the moment, marketing must adapt. Finding the most effective ways to reach them means working harder to track and interpret complex customer journeys. 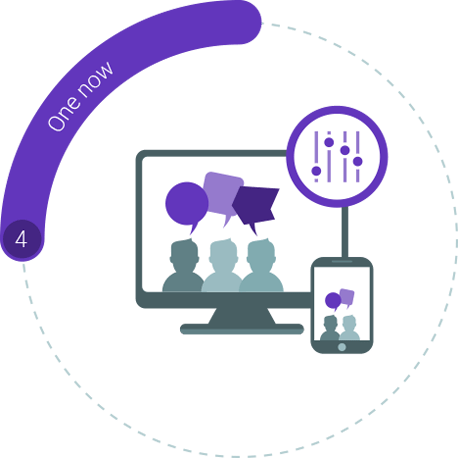 BySide is able to connect journeys across all devices, displays, touchpoints and channels, enabling a truly multichannel management or, as we prefer to call it, enabling an holistic view of the customer. Once you have this panorama, you can easily work out which actions make sense and when, plan them and deploy them through the platform. BySide is able to connect multiple journeys enabling an holistic view of the customer. Identification is the first step to personalisation and One2One interactions. But how many customer IDs do you have in your company? Due to the fairly recent proliferation in the number of channels, companies have been trying to adapt, and most have been using different IDs in different channels.You may have an internal customer number, but in some contexts you will use the email address to identify the customer instead. The same goes for phone number, loyalty card number, VAT number, and so on. So, if you use different IDs, how can you have a single view of the customer in the first place? The answer is BySide ID unity. It consists on a compound ID that is responsible for integrating customer information generated under any channel-specific IDs. It cracks the code of identification and unlocks a unified view of your customer, without the need to change the entire logic behind your current information systems. It’s the best way to make a smooth transition to fully holistic model of customer management. Medium Trust: Customer ID information is stored in a cookie. This means that even if the customer logs out, it may still be identified, which is why the level of confidence is not as high as in the previous method. Also, you can define the persistence of the cookie (it may expire by the end of the session or after X days) - the shorter the persistence, the higher the confidence level. This is important because different levels of ID trust suit different types of personalisation. Perhaps you wouldn’t like to personalise content with the name of the customer (or any other personal information) if you are not 100% sure who’s behind the screen. But if you are, you can leverage the potential of personalisation using more personal information. Some companies want to do both: have personalised content that does not use personal information, but also deeply tailored One2One communication. That’s why we allow you to combine both methods: you can have Medium Trust ID as a basis for macro-personalisation, and High Trust ID for micro-personalisation (yes, we have just invented those terms!). Medium Trust ID as a basis for macro-personalisation, and High Trust ID for micro-personalisation.